As many of you know, my family and I spent a portion of the winter solstice this year atop one of the highest points in the Pacific, mount Haleakala on Maui. No, the “mother ship” never arrived, at least not in the physical sense anyway. The chilly mountaintop was well inhabited however, with other curious enthusiasts of astrology and spirituality, and certainly a general sense a peace and feeling of good humor was readily palpable. Isn’t it just marvelous, that people have been speaking of this date for decades, if not centuries, wondering what will happen, and now it has come and past? Many people just roll their eyes and say nothing happened. I think not. What happened on 12-21-12 is certainly a matter of perspective. Too esoteric for you? Well remember, today’s spiritualism is tomorrow’s science. If you presistently need to run things by your rational mind, which is controlled by your ego-sense of who you believe yourself to be in this limited physical existence, you’ll always come up with limited answers. Albeit they may feel good to you at the moment, but this does not mean they are true. Truth does not need any validation. It doesn’t care about what you believe, and it doesn’t wait for you to catch up with it or try to figure it out with your conscious mind, which you can never do anyway. Truth just is, and on some level beyond your ego-sense you know who you really are, and you understand everything. When we first begin to get in touch with this truth we call it intuition; i.e., that nagging sense of knowing that you are more than you present to be, if only you could more fully connect. That is precisely where this new light, recently introduced to our physical world, comes into play. Its there. Its everpresent. Its all encompassing. But what does this mean for you? Can you feel it? Whatever your answer to that question is, bear with me a moment and lets continue on a bit. No matter what your conscious mind preceives God, universal force, or light energy to be; no matter what form of “middle-man” ( sage, avatar, son-of God, priest, church, religion ) you feel is necessary to connect with such light energy, the fact remains that it exists and is all around you, constantly, regardless of whether or not your actions in this physical world allow you to preceive it. Where are you on the “God-experience” gradient scale? If you are feeling fear, hopelessness, depression, anxiety, anger, resentment, egotistical based elitism, greed, jealousy, hatred of any kind……..well then you’re toward the bottom of the barrel. In contrast, if you are feeling love for all beings and things around you, seeing them as extensions of your own “love-self,” if you can find the joy in every moment and effectively shut out the “misery-media-play” perpetrated upon this physical world, if you feel like you are thriving in life and protected by a sense of goodness within your heart, like the life-force within your body can handle anything and keep you pure and loving all the days of your life; if you feel like you are offering a life-service that is uplifting the planet and bringing people closer to experiencing the light within, and most importantly, if you are surrounded by people, animals and circumstances of living that you absolutely adore………I’d say you’re doing pretty great and that connection is not an issue for you! As of December 21, 2012, it is easier than ever to connect with this light that will transform your life. This is not religion, and moving this statement even beyond spirituality, there is a scientific basis for understanding why this is so. Your more “rational” conscious mind will appreciate that, so let’s begin. Our Universe is a conscious, living, vital and thriving organism that, like us as human beings, is involved in a process of evolution and expansion. Scientifically this make sense. Our planet Earth rotates around our sun on a regular schedule with a number of other planets that comprise our solar system. Our solar system in turn, is part of a collective of solar systems which further rotate on a schedule around the center point of our galaxy. Going even further, our galaxy is part of a group of galaxy’s which rotate around another center point in the Universe. Going much, much smaller now, every atom we have within us, with their central electromagnetic nuclei and orbiting electrons, is yet a microcosym of how this energetic rotation occurs in the macrocosym solar systems and galaxys. We are all children of these energetic forces, whether or not we are aware of this fact, whether or not we choose to accept it. The position of our beautiful planet is effected by the gravitational / varying energetic forces which occur from these complex rotations, and we as living beings on this planet are effected as well. The important thing to remember about 12-21-12, and beyond, is that our present position in the cosmos offers new and greater opportunities to “tune in.” Tune into what, you might ask? Well………….. the love of course which is now more clearly streaming toward our planet, and more readily available to tune into. Does this mean a bunch of extra-terrestrial hippies have found a more direct way to give us their flower-power? Perhaps, but what we also need to remember is this. What we call “love” is, on the grandeur scale, identical to the cosmic force which rotates electrons within atoms, brings two cells together to create a human body, and forms a giant Redwood from a tiny seed, simply by placing it in the dirt. Things have opened up, and those of us who are initially sensative to energy have most likely felt this shift already. If you have yet to feel any difference, I would suggest letting go of a few more emotional “luggage cases.” Take more walks in nature. Spend more time with a cat. Spend more time playing with a happy child. Swim in a waterfall. Dance naked in your backyard at midnight. Begin a regimine of yoga classes. Sit quietly in your car undisturbed, put on your favorite relaxing music and chant Om . Chant loud enough so you feel the vibration in your throat and chest. Start with a 10 minute “clearing of your mind” meditation each day. During this time, do your best to just focus on your in / out breath, and stop thinking. If thoughts come up, watch them like you would a TV you were flipping through with a remote control. See the thoughts that pop up on the screen of your mind as non-important, at least for this 10 minutes, and notice the sweet feelings that arise in your heart as a result. Just sit, and simply don’t care what your mind does. Re-direct your focus to your breathing. 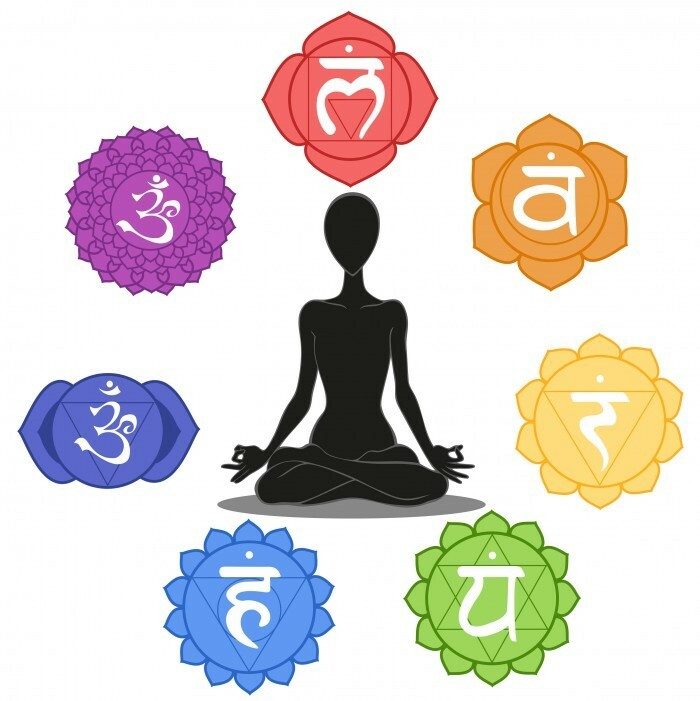 A good focal point, called a dharana in yoga, is to place your attention on the point where your in breath meets your out breath, then breath comfortably out, and focus on the point where your out breath meets your in breath. If you have even the slightest interest in discovering whether or not this is true, just give it a try. Even if your conscious mind thinks its totally ridiculous, give it a try anyway. You have absolutely nothing to loose, and everything to gain. Especially new at this point in our cosmic journey here on Earth, is a warm blue-crystal and sparkling light, which is an energetic stream of pure love now available to heal and transform any condition or situation that may be challenging to you. Lets talk a bit more now, about how all this fits into “life” as we may presently preceive things to be. We have our stresses, we have our responsibilities, bills to pay, jobs to go to, children to raise, studying to do, and challenges to heal from. Meditation, time for myself and all this talk about loving energy is great, but how is that going to make my life any better? Can I trade in my new spiritual understanding for a beach house on Maui, a corvette, and paid college educations for all my kids with a few million $$ ? Why bother with all this crazy stuff when I have so much to do!? To answer these questions, let’s dive a bit deeper into how your energetic / emotional life is truly set up on this planet we call home. Consider yourself to be like the atom, with your “core nucleus” being what Monroe called the “core self.” This can be thought of as the original Human mind, comprising the sum of all our Human experiences throughout several lifetimes ( or just this lifetime if your are not privy to past lives ). These experiences are mixed, so to say, with the pure innate knowledge that you are an energetic being with the full power of Universal creation at your fingertips; in other words, at this core level of “mind,” you know you are in essence, God-power. This level can be called your “spirit,” and your sense of who you truly are. The next level up is the Animal Sub-Self. The Human-animal self is our identification with this particular physical incarnation, and the struggles / pleasures which are associated with our physical-animal body, which requires constant maintenance. We need to bathe, brush our teeth, exercise, eat properly, and deal with feelings, drives and emotions which are a mixture of our Earthly animal hormones, and our attachments to an ever evolving Human-family social order. We are persistently acting to control this level of basic, animal nature, and are evolving past our sense of reliance on it. This level is controlled by the more basic levels of our central nervous system function, located in our mammalian brain and limbic system. The big problem with this layer is that we believe we need it to survive. This is because the Animal Sub-Self is controlled by an array of hormones which are reactive to “the moment.” When left unchecked by the conscious mind, these hormones can easily be manipulated via an outside source to keep a being, or a species, in persistent “fight-or-flight” animal response mode. In an effort to control the masses for their own benefit, varying elitist Human clans purposely show humanity images through many different forms of media, which keep the hormones REACTING to stress and fearful situations. Thus the individual nervous system being manipulated, and the nervous system of humanity as a collective, is persistently locked into fight-or-flight. When we learn as individuals to control the highly reactive Animal Sub-Self with true knowledge from the Core Self, hormones are redirected towards higher vibrations of love, peace, harmony and faith with all things around you, and this spawns power and evolution in ways that humanity is just beginning to wake up to, once again. The next level up is the Conscious mind. This is the level of mind where you are conscious of what you believe yourself to be, or what you think you are; all your identifications with this world, i.e., man, woman, mother, father, teacher, preacher, scoundrel or saint. This level of what you THINK you are however, is completely different from the Core Self’s KNOWING of who you are. 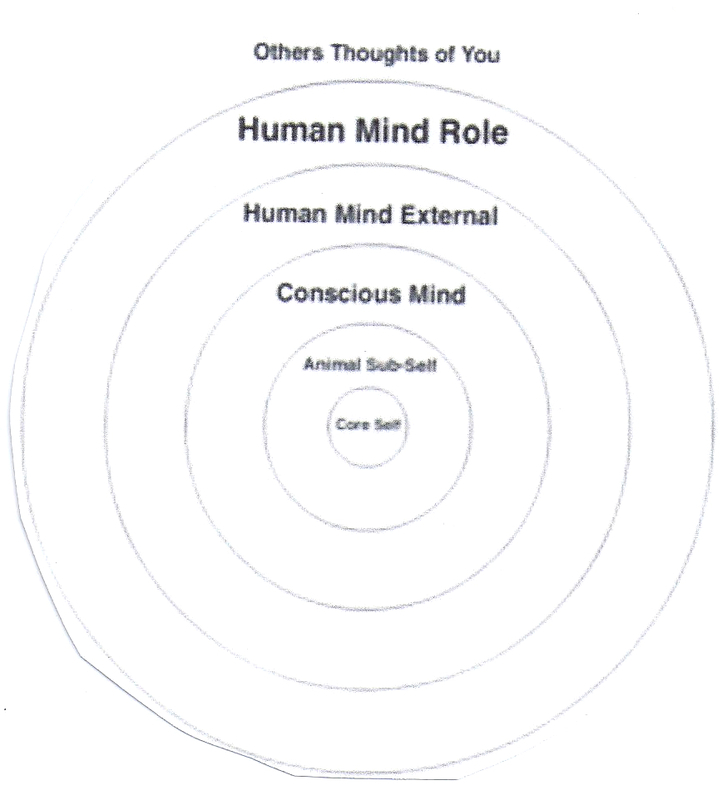 This level of Conscious mind is distorted with its contact with the Core self, because it needs to pass through the Animal Sub-Self to gain its knowledge. This level of Conscious mind is complicated by accumulated belief systems in which a soul may spend life-times attempting to break out of in order to get to the Core Self. Moving up is the Human Mind External. This is our façade; what we think and WANT others to think of us. This lawyer is constantly changing with new experience and perception, but it is still controlled by erroneous belief systems that have more to do with cultural mores and nothing to do with the Core self. From this level we create artificial motivations and drives which are for the most part, futile, and make a being act more like a hamster on an exercise wheel. This leads to mental / physical dysfunction and exhaustion due to these distortions, separating us more from the healing energy of the Core Self. Instead of being who you truly are, you begin from this level to lead a totally reactive existence and forces outside yourself are constantly “pushing your buttons.” If you allow this level of mind and lifestyle to take over your life, it can be a living hell. Next level out is the Human Mind Role. This is the outer-most superficial, SKIN DEEP LEVEL ONLY, of what you want others to think of you. It is the façade over the façade, and completely devoid of intuition or feeling. This level is composed of your ACCEPTANCE of the energies of the media and world around you. Life says I’m a computer-operator, so that’s what I am. Life says I’m jerk, so that’s what I remain. This level is very much set by allowing and accepting the energies of other people / organizations, but hopes and dreams also exist on this level if the Core Self is allowed to filer through the cracks. But in many people, this level is devoid of any trace of the Core Self. It is very cautious to speak, and in many cases covered by an array of complex deceptions (lying to ones’ self) that the person may not even be aware of. Finally, the outermost layer, much more important than one may expect, are the psychic energy forces created via what “others” may think of you. We are a human collective mind, whether or not you believe this or are aware of it. The energies of how “others” perceive you on both a specific and general level, are very important. This is where your previous and present actions in the world make a big difference in your human presentation over space / time. Some people call this Karma; your actions, good or bad, eventually catch up with you at some point in your life from this level. As well, erroneous thoughts and manipulations from the media are thwarted at us as a human collective at this level, and we must be conscious enough, and evolved enough, to filter these messages away into our junk folder. Think of yourself as existing on an energetic level as a hologram every time someone thinks of you. If several people are thinking about you at any given time, you are existing, in a psychic holographic sense, in several places at once, and the energies resonating out from each of these holographic creations directly effects you in the moment. On some level, the psychic hologram that another human being is projecting out of you is a mixture of who you actually are, and who they believe you to be. This affects both you and them on very intimate levels, and as well, affects who we believe we are as a human collective regarding our limitations, or limitlessness. In many ways we can be individuals with creative, specific desires. At the same time however, ignoring our human-collective mind is foolish. We live in both these worlds simultaneously. So 12-21-12 is all about evolution really. The stage has been set, and depending on how we choose to acknowledge, ignore or deny the new energies now ever-present, we will either learn something new about ourselves or continue on as we always have, bouncing off one experience in life to the next in an attempt to keep our head above water. One thing is certain though. Which ever of these choices you choose, if not a mixture of the two, there will be this nagging feeling of truth in your heart beckoning you to more forward and take part in the evolution of human kind. You have so much more control over your life than you may presently be aware. Regardless of how much certain people may not want you to discover your true power to manifest in your life, the fact is that this control, and the beautiful things inherent within it, are more readily available to you now than ever before. It is right at your fingertips. Thanks for sharing this wonderful message Wil it is beautifully written and so clear to understand. The warm blue light is in our crystal daughter’s beautiful clear eyes. Thank you for the article sweetheart, love the micro/macro contemplation! My heart is ever more sweetened by your post my love, and experiencing this solstice, and this energy, together with you in Maui was life transforming.